The faster you go...the more protection you need. Convert a 8-point roll bar to a 10-point roll cage. Eight to 10-point conversion kit includes upper halo and A-pillar tubes. Tubing size is 1-5/8''dia. x .134'' wall. Also convert a 10-point to a 12-point cage. Twelve-point conversion kit includes 5 braces of 1.25'' x .134'' tubing. 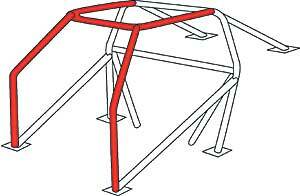 Both Jegster conversion kits will fit any of the Jegster Roll Bar and Cage kits.